SAUDI-BASED Quality Control Services sees boom times for it in the kingdom over the next five years. “Large scale projects were awarded between mid to end 2012, which is translating to high demand for non-destructive testing (NDT) in the oil and gas sector. We therefore foresee booming work for the next five years,” says Dr Mohammed Awadallah, general manager, Quality Control Services (QCS). Before 2012 a lot of work was pending. Most NDT companies are now busy, and even small companies face shortages of labour/technicians, he explains. “Our technicians are now at 100 per cent utilisation rate,” he says. “Since 2009 we have grown at a healthy rate. 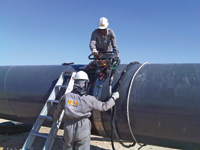 QCS is already one of the top 10 biggest NDT services providers in Saudi Arabia. We are set up for the long-term,” he says. As well as providing in-house NDT services, QCS outsources some services to US, Canadian and German companies. Among the high-profile projects being executed by QCS is Manifa Phase 1, where the company is inspecting pipelines on the ship and under the sea using UT scan technique in association with its joint venture partner Canadian company UTQuality. UTQuality Arabia is QCS’s sister company in Saudi Arabia, and offers sophisticated NDT services, he says. “One of the key factors behind our growth in the 2009-2012 was our commitment to maintaining quality, which has given us credibility in the eyes of our clients. “We are also pioneering new technologies. We are working as part of a consortium with universities building a robot which will one day carry out RT testing on a commercial scale. It is an example of cooperation between industry and academia,” he says. “We have also introduced a new technique – phased array also called AUT (advanced automated ultrasonic testing).We also offer IRIS (internal rotary inspection system) which is the most efficient way to test specific types of plant, for example heat exchangers,” he says. The company already has facilities in the Eastern Province (Dammam, Khafji and Jubail) as well as the western province (Yanbu and Rabigh). It also plans to set up facilities in Jizan. Dr Awadallah feels that Saudi manpower is very important for the success of any venture. “We want to employ Saudis. For our sector we have a 16 per cent stipulation from the government. We are currently at 34 per cent Saudisation, some of whom are graduates from the Jubail Industrial College. “We run a one-year radiotherapy training course for 14 Saudis at Khafji, a location where no one else is investing in training. Out of the 14 Saudis, we have got four to work. The other 10 we are trying to retrain,” he says. In terms of the future, he says: “We have developmental priorities including establishing relationships with universities in Jordan.